Complex carbohydrates include all carbohydrates with at least two sugar molecules linked together (disaccharides, oligosaccharides, and polysaccharides). As discussed previously, monosaccharides react with alcohols to form acetals. 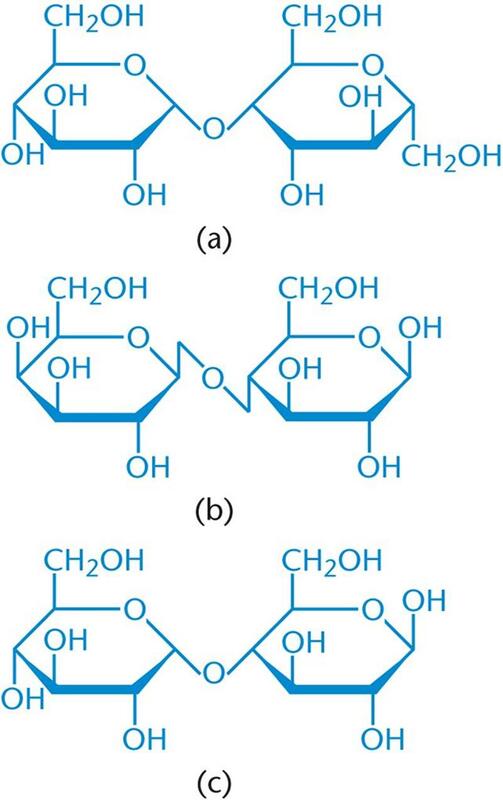 Glycosidic bonds formed between hydroxyl groups of two monosaccharides result in the formation of a disaccharide, as shown in Figure 4.16. Figure 4.16. Disaccharide Formation The hydroxyl group on the anomeric carbon reacts with the hydroxyl of another sugar to form an acetal (or ketal) with a 1,2; 1,4; or 1,6 glycosidic linkage. Formation of an α- or β-glycosidic linkage is nonspecific in that the anomeric carbon of a cyclic sugar can react with any hydroxyl group on any other sugar molecule. The linkages are named for the configuration of the anomeric carbon and the numbers of the hydroxyl-containing carbons involved in the linkage. For example, in an α-1,6 glycosidic bond formation between two D-glucose molecules, the α-anomeric carbon of the first glucose (C-1) attaches to C-6 of the second glucose. Note that the second glucose could be either the α- or β-anomer. In the event that a glycosidic bond is formed between two anomeric carbons, this must be specified in the name. For example, a bond formed between the anomeric carbons of two α-D-glucose molecules would be termed an α,α-1,1 linkage, as demonstrated in Figure 4.17. Figure 4.17. Trehalose Example of a disaccharide with an α,α-1,1 linkage between the α-anomeric carbons of two glucose molecules. Various combinations of monosaccharides linked by glycosidic bonds result in the formation of different disaccharides. For instance, two glucose molecules linked by an α-1,4 glycosidic bond is called maltose, while two glucose molecules joined by a β-1,4 linkage is called cellobiose. When discussing disaccharides in a real-world context, the most important of these sugars are sucrose, lactose, and maltose. These disaccharides are commonly produced in the cell by enzymatic activity. Their molecular structures and linkages are highlighted in Figure 4.18. Figure 4.18. Important Disaccharides (a) Sucrose (glucose-α-1,2-fructose), (b) Lactose (galactose-β-1,4-glucose), (c) Maltose (glucose-α-1,4-glucose). Polysaccharides are long chains of monosaccharides linked together by glycosidic bonds. While glucose is the most frequently encountered monosaccharide, it is not the only one. A polysaccharide composed entirely of glucose (or any other monosaccharide) is referred to as ahomopolysaccharide, while a polymer made up of more than one type of monosaccharide is considered a heteropolysaccharide. The three most important biological polysaccharides are cellulose, starch, and glycogen. Although these three polysaccharides have different functions, they are all composed of the same monosaccharide, D-glucose. These polysaccharides differ in configuration about the anomeric carbon and the position of glycosidic bonds, resulting in notable biological differences. Because glycosidic bonding can occur at multiple hydroxyl groups in a monosaccharide, polymer formation can either be linear or branched. Branching happens when an internal monosaccharide in a polymer chain forms at least two glycosidic bonds, allowing for branch formation. We'll take a closer look at how this is a key part of glycogen synthesis and glycogenolysis in Chapter 9 of MCAT Biochemistry Review. Cellulose is the main structural component of plants. 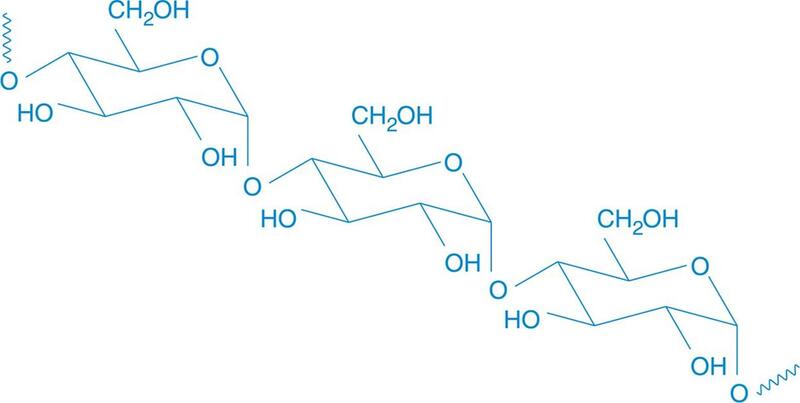 A homopolysaccharide, cellulose is a chain of β-D-glucose molecules linked by β-1,4 glycosidic bonds, with hydrogen bonds holding the actual polymer chains together for support. Humans are not able to digest cellulose because we lack the cellulase enzyme responsible for hydrolyzing cellulose to glucose monomers; in fact, humans cannot digest any β-linked sugars. Therefore, cellulose found in fruits and vegetables serves as a great source of fiber in our diet, drawing water into the gut. Cellulase is produced by some bacteria found in the digestive tract of certain animals, such as termites, cows, and goats, which enables them to digest cellulose. A portion of a cellulose chain can be seen in Figure 4.19 below. Figure 4.19. Cellulose Structure Cellulose is a polymer of 1,4-linked β-D-glucose. Starches are polysaccharides that are more digestible by humans because they are linked α-D-glucose monomers. Plants predominantly store starch as amylose, a linear glucose polymer linked via α-1,4 glycosidic bonds. Another type of starch is amylopectin, which starts off with the same type of linkage that amylose exhibits, but also contains branches via α-1,6 glycosidic bonds. Iodine is a well-known reagent that tests for the presence of starch and does so by fitting inside the helix conformation amylose typically makes, forming a starch–iodine complex. The structure of amylose is depicted in Figure 4.20. Figure 4.20. Starch Structure Starches are polymers of 1,4-linked α-D-glucose. The contrast between cellulose and starch digestibility exemplifies the specificity of enzymes. A slight 109.5° rotation of the anomeric carbon to form β-linkages (instead of α-linkages) is enough to make the molecule indigestible by any enzymes in humans—even though they're bothD-glucose polymers! Enzyme specificity is discussed in Chapter 2 of MCAT Biochemistry Review. Starches like amylose and amylopectin are broken down by enzymes in the body and are used as a source of energy. Amylose is degraded by α-amylase and β-amylase. β-amylase cleaves amylose at the reducing end of the polymer (the end with the free anomeric carbon) to yield maltose, while α-amylase cleaves randomly along the chain to yield shorter polysaccharide chains, maltose, and glucose. Because amylopectin is highly branched, debranching enzymes degrade the polysaccharide chain. Glycogen is a carbohydrate storage unit in animals. It is similar to starch, except that it has more α-1,6 glycosidic bonds (approximately 1 for every 10 glucose molecules, while amylopectin has approximately 1 for every 25), which makes it a highly branched compound. This branching optimizes the energy efficiency of glycogen and makes it more soluble in solution, thereby allowing more glucose to be stored in the body. Also, its branching pattern allows enzymes that cleave glucose from glycogen, such as glycogen phosphorylase, to work on many sites within the molecule simultaneously. Glycogen phosphorylase functions by cleaving glucose from the nonreducing end of a glycogen branch (the end with no free anomeric carbon) and phosphorylating it, thereby producing glucose 1-phosphate, which plays an important role in metabolism. Hers' disease, also known as glycogen storage disease (GSD) type VI, is a condition characterized by a deficiency in liver glycogen phosphorylase. These patients cannot break down glycogen in their livers, and therefore have hepatomegaly (a swollen liver). They may also have hypoglycemia (low blood sugar) between meals because they cannot use glycogen to maintain blood glucose concentrations. 1. Which of the two forms of starch is more soluble in solution. Why? 2. Regarding glycogen and amylopectin, which of these two polymers should experience a higher rate of enzyme activity from enzymes that cleave side braches? Why?